Oh gosh, how I love chocolate. There’s just something about it – the bitterness, the creaminess, that satisfying texture that you can’t quite describe. I’ve been following an anti-Candida diet lately and at first was struggling to find any sweet treats. (Although there are various versions, most anti-Candida diets eliminate nearly all sugars and carbs, making baking etc. a real challenge.) 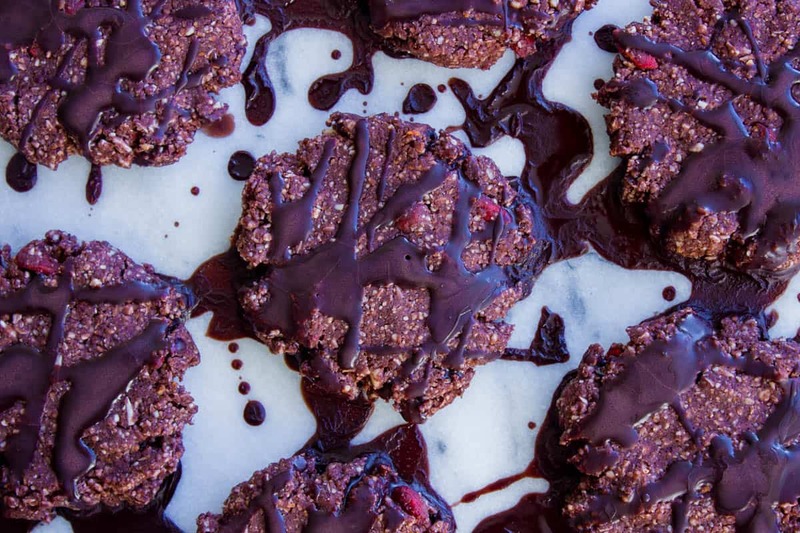 In the end I knuckled down and spent a few evenings in the kitchen throwing ingredients into a blender to see what happened (the results were the delectable Coconut and Goji Energy Bites and my Raw Chocolate). 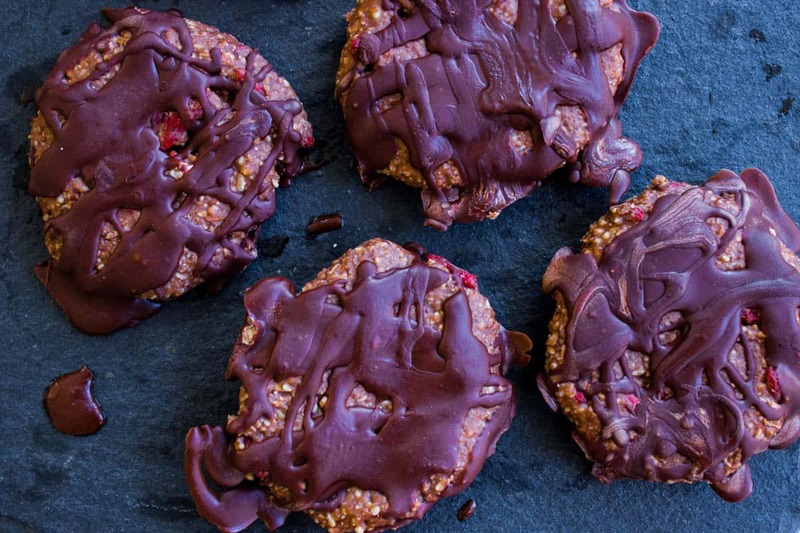 Finally, really craving something ‘biscuity’ I came up with these no-bake Chocolate Hazelnut Freezer Cookies and let me tell you, they are GOOD. Chocolate and hazelnut are a delicious combination and in my opinion aren’t used often enough together. The coconut butter and goji berries combine to add light sweetness here, while not being high in sugar. (Although if you’re unrestricted in your sugar intake and prefer a sweeter cookie, I recommend adding a tablespoon of maple syrup to the mix.) The almonds are an excellent slightly sweet base for the cookies, while the shredded coconut adds delicious texture. Finally, the chocolate drizzle – while not sweet – adds a decadence to the cookies that makes them feel like a real treat. A note about ingredients: You might think I’ve used an unusual combination of ingredients here. Because of my dietary limitations right now, I have to avoid things like maple syrup, oats and raisins etc. so I use more unusual ingredients to sweeten my recipes (and they give an amazing flavour). 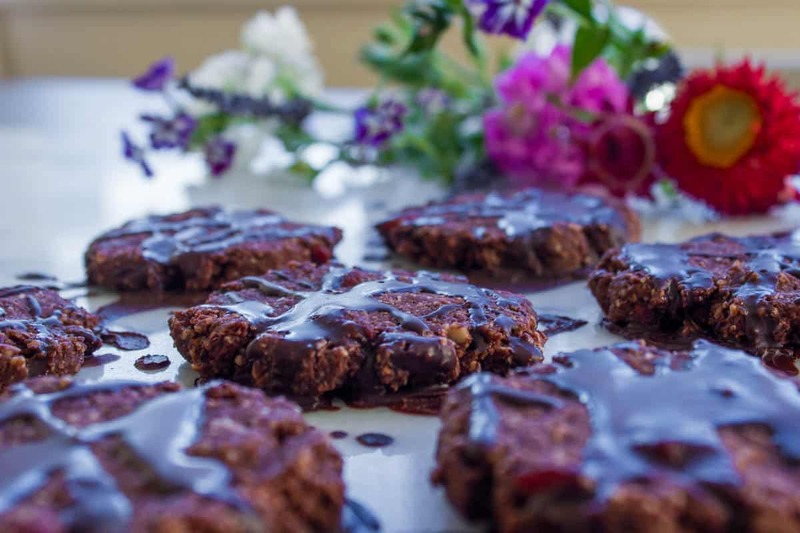 I am well aware that the above are cheaper than the coconut butter, almonds and goji berries used in this recipe, so please feel free to substitute them if you prefer. They will change the taste of the cookies a bit but they’ll still be delicious! Tip: Store any uneaten cookies (ha!) in a container in the freezer – they will soften and melt if stored at room temperature. Place the almonds in a blender and puree until a coarse flour is formed. Add to a large mixing bowl with the rest of the dry ingredients and vanilla essence. Add in the coconut butter, hazelnut butter and coconut oil and use your hands to mix these into the dry ingredients. Give it a few minutes – you’ll find that the warmth of your hands starts to melt the oils and you’ll end up with a sticky dough. Shape this dough into 6 or 7 balls and press them flat onto a baking sheet covered in baking parchment. Place the tray in the freezer while you complete the next step. For the chocolate drizzle, over the lowest heat possible in a small saucepan melt the coconut butter and coconut oil and add in the cacao/cocoa. Stir until you have a runny mixture and there are no lumps left. Remove the cookies from the freezer, and using a spoon drizzle the chocolate over them. (It gets messy but that’s what the baking parchment is for!) Return the cookies to the freezer for another 5-10 minutes and voila – they’re ready.